You can get started by reading this. In this post, I will load data from custom format files into Azure Data Lake Analytics (ADLA) tables. This is the first step before running some analytics on the data. It is the first checkpoint of the process. When I say custom format file, I mean files that do not fall in the CSV / TSV / delimited file format. This will lead us to explore how to use C# to do part of the parsing. I won’t lie to you: the product has a few rough edges in its first version of Public Preview, so I hope this post helps you find your destination faster! We’ll go through it in this post. So the plan here is to persists the three tables into three ADLA tables, following the checkpoint patterns. I looked for some big data set and struggled a bit. I either found tiny data sets with the equivalent of one-table or huge ones (multiple TB) which are a bit prohebitive for proof-of-concepts (POC) such as this post. I settled for a fun one I found on Amazon AWS: Social characteristics of the Marvel Universe. It’s basically a data set about which Marvel characters appear in which comic books. It is a non-trivial size but by no mean big data set. So using Hadoop, a big compute engine, on it is a bit of an overkill but it’s for POC, isn’t it? 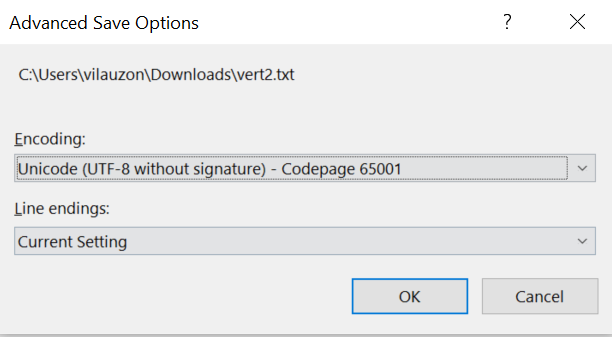 choose “Save with Encoding…”, choose UTF-8 without signature and save them. While we are at it, for the last file, i.e. porgat.txt, we’ll need to remove the first part of the file. Search for “*Edgeslist” and delete everything before it. The file should now start with “1 6487”. 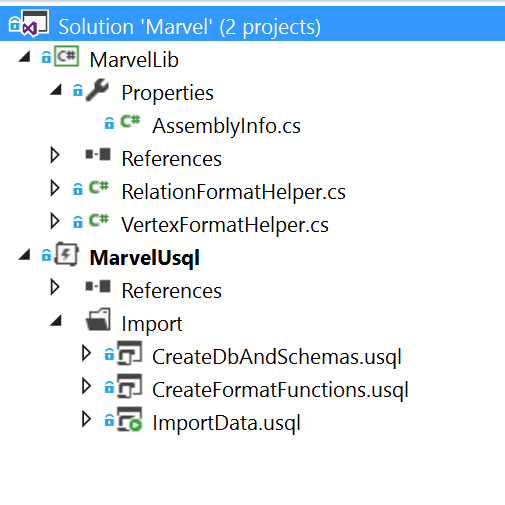 Let’s copy those three files under your ADLS in one Marvel folder. I won’t cover the basics-basics, please read Logistic / Get Started. I want to put all the tables inside a database container so let’s create a database with two schemas: one for the raw input files (as tables) and one for analytics (I’ll use it in a future post only). Remember USQL keywords must be uppercase in order not conflict with C# (e.g. SELECT vs select in Linq / C#). You can submit that as a job and validate in the portal that the database is created. You will not see the schemas there yet though. I’ve tried different approach before seattling for this one. Basically, the first two files share the same format while the latter has a different one. I didn’t want to repeat the code for the first two files. We could invoke some C# codes twice but I found that using an USQL function, itself invoking C# methods, to be the most elegant. I fully covered how to register assemblies in this post. For this, since we are invoking C# code from within a function, we are going to use the Visual Studio Register Assembly option. The C# code is going to reside in a separate assembly. The function takes a string in parameter representing a file set. A file set in U-SQL is either a file path or an expression representing multiple files (typically with ‘*’). Notice the reference assembly operation within the body of the function. This is necessary to use the C# method defined in that assembly. The first expression parses the text file into rows. We use a little hack to parse an entire row (line) at the time since U-SQL (at this point in time) doesn’t support to load one line at the time directly. In the second expression we use the C# method to extract the ID and the label in each line. The second expression is what is returned by the function. We’ll see how we’ll further transform the expression. Again the format is pretty straightforward but isn’t directly supported by U-SQL Extractors. In the first expression we parse the lines of the file. In the second expression, we use the C# methods to extract the main ID and the list of relation IDs as an SQL Array. In the third expression, we explode the array of relation IDs on different rows. I covered the CROSS APPLY EXPLODE in the following post. You can submit the script as a job. This will create the two functions. We’ve built all the tools to easily import the files into ADLA tables. We covered a lot of material and I hope it is useful to author your scripts. We demonstrated the power of C# code to parse files having non-trivial format. The result is a row-set we can further manipulate with projections and others. We also persist the data into indexed & partitionned ADLA tables. This is useful because we’ll be able to run analytics on the data (in future posts) without processing the data from scratch.